Minneapolis–Saint Paul, also known as the Twin Cities of Minneapolis and Saint Paul, in the state of Minnesota, United States of America, has two major general-interest newspapers. The region is currently ranked as the 15th largest television market in the United States. The market officially includes 59 counties of Minnesota and Wisconsin, and extends far to the north and west. The radio market in the Twin Cities is estimated to be slightly smaller, ranked 16th in the nation. The two major general-interest newspapers are the Star Tribune in Minneapolis and the Saint Paul Pioneer Press. The Minnesota Daily serves the University of Minnesota's Twin Cities campus and surrounding neighborhoods. The Minnesota Spokesman-Recorder, One Nation News and the Finance and Commerce business daily are published in Minneapolis, as is the Web-based MinnPost.com. A number of other weekly and monthly publications (most of which are fully supported by advertising) are also available. The most prominent of these is Village Voice Media's City Pages, the alternative weekly. (2002 newcomer The Rake offered some competition in the form of a free monthly, but ceased publication in 2008.) Pulse of the Twin Cities is another weekly which has less advertising and more coverage of local music and activism. La Matraca Magazine is a Spanish Language Weekly print and online publication. There are also numerous weekly student publications at area colleges, including the University of Minnesota's The Wake student magazine, Macalester College's The Mac Weekly, and St. Thomas' TommieMedia.com, which replaced student newspaper The Aquin that was shuttered in 2009. Minneapolis community newspapers include the sister publications Downtown Journal, formerly Skyway News, and Southwest Journal, which cover downtown and southwest Minneapolis, respectively, as well as numerous neighborhood papers such as the North News, Seward Profile, Southside Pride, and Whittier Globe. Only one weekly newspaper is devoted to neighborhood news in either city: St. Paul's East Side Review. Saint Paul also has a monthly, Highland Villager, and a bi-monthly neighborhood newspaper for Frogtown, Greening Frogtown. Instead of a neighborhood or general-interest news, some periodicals focus on a particular topic, such as the ones covering the Minnesota music scene. Others are audience-specific, such as Lavender Magazine for the state's gay community. The Minnesota Women's Press, one of the few feminist newspapers in the country, serves the local feminist community. Other such periodicals of note include the Asian American Press  and The Catholic Spirit. The only major television station in the Twin Cities with its main studios located in Minneapolis is WCCO-TV, a CBS owned-and-operated station that broadcasts from studios along Nicollet Mall in downtown Minneapolis. Five other stations maintain studios in St. Paul: Twin Cities Public Television operates both of the Twin Cities' PBS member stations, KTCA and KTCI. ABC affiliate KSTP-TV and independent station KSTC-TV are owned by Hubbard Broadcasting. The local affiliate of The CW, WUCW, is owned by Sinclair Broadcast Group. Three other stations serve the Twin Cities from studios in suburban areas. Fox O&O KMSP-TV and MyNetworkTV O&O WFTC are co-owned by Fox Television Stations, with studios located in Eden Prairie. KARE is the NBC affiliate in the Twin Cities, owned by TEGNA and based in Golden Valley. For much of the last two decades, KARE had the most popular evening newscasts. 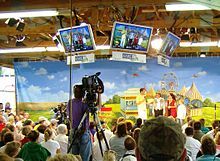 Since around 2010, however, WCCO has become the most watched station in the market in nearly all time slots. On the other end, KSTP has struggled to maintain ratings on its news programs. KMSP has had a 9 o'clock newscast since at least the early 1990s when it was a UPN affiliate. KSTP claims to have been the first station in the country to run a regular nightly newscast. It is the oldest station in the state to still be operating, having first gone on the air in 1948. TV broadcasts first occurred more than a decade earlier during the 1930s when engineers for radio station WDGY (now KFAN) experimented with a mechanical television system. Mechanical TV quickly lost favor, and the station's owner decided to let the license expire in 1938. Communities in the region have their own Public, educational, and government access (PEG) cable tv channels. One channel, the Metro Cable Network, is available on channel 6 on cable systems across the seven-county region. Minneapolis Telecommunications Network (MTN)  has three public-access television cable TV channels and Saint Paul Neighborhood Network (SPNN)  has two. Area residents of the right age look back fondly on many of the locally produced shows that were on the air for about two decades, from the early days of TV in Minnesota up until the 1970s. WCCO, KSTP, KMSP, and WTCN (now KARE) all had children's shows, though there were a few other notable shows targeting an older audience. Several television programs originating in the Twin Cities have been aired nationally on terrestrial and cable TV networks. KTCA created the science program Newton's Apple and distributes a children's program today. A few unusual comedic shows also originated in the area. In the 1980s, KTMA (now WUCW) created a number of low-budget shows, including the cult classic Mystery Science Theater 3000 (which later aired on The Comedy Channel/Comedy Central from 1989 to 1996 and the Sci-Fi Channel from 1997 to 2004). The short-lived Let's Bowl (which aired on Comedy Central) started on KARE, and the PBS series Mental Engineering originated on the St. Paul public-access television network. Eleanor Mondale of WCCO radio interviewing Fred Thompson at the Minnesota State Fair on 2007-08-27. For decades, WCCO radio was the best-known and most popular broadcaster in the region, with an all-day talk and news format. It was eventually edged out of the top spot by KQRS, a classic rock station with a popular morning show, although in recent years KQRS has been overtaken by other stations in the market hierarchy. Locally owned KSTP offers a pop music format on FM as KS95 and a sports talk format on AM1500. K102 and Buz'n 102.9 are the two major country music outlets. KDWB is the market's legacy Top-40 station. Radio K, on the other hand, is still largely an "AM daytimer" and must shut down at night to make way for two other stations located in New York and New Mexico. However, the station is also heard on three FM translators in the metro, and on the Internet. It is, by most accounts, the oldest in the state, receiving a license for the call sign WLB in January 1922. Minnesota Public Radio (MPR) is also a major force in the state and across the country, best known across the U.S. for the variety show A Prairie Home Companion. 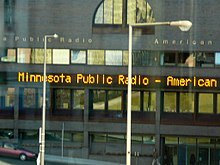 Based in St. Paul, MPR is reportedly the nation's second-most powerful public radio organization behind National Public Radio (of which MPR is an affiliate). Cities 97 is notable for its yearly compilation of live recordings, the Cities Sampler, which is now so popular that people camp out at local Target stores overnight when it is to be released. The last few volumes of the CD have sold out within a few hours. Some area residents[who?] feel that the overall quality of radio in the region is poor, particularly considering the area's appetite for the arts. Radio K and community radio station KFAI are often said by media and music critics to be the best area stations because these stations' focus on local music (Minnesota has a major local music scene, see music of Minnesota). However, many listeners find the formats of these stations to be disjointed and difficult to listen to due to their relatively unpolished presentations. Both are hampered by relatively weak signals, but attempt to compensate with Internet radio streaming. MPR's KCMP, with a stronger signal, broadcasts as "89.3 The Current" and competes somewhat with KFAI and Radio K with its eclectic music format. Music aficionados in the northwestern suburbs sometimes tune into the St. Cloud State University station KVSC, which is also well-regarded. A few pirate radio stations have been found on the local dial from time to time. The most famous of these was Beat Radio 97.7 in 1996, which was co-created by area programmer and DJ Alan Freed. Freed went on to broadcast the Beat Radio dance music format from a number of different area stations (and nationally); he later programmed dance music channels on XM Satellite Radio. 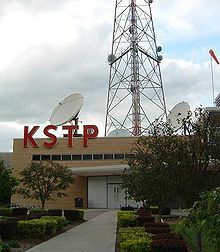 Most of the major TV and radio transmitters are located in Shoreview, Minnesota, and backup facilities for some are maintained atop the IDS Center in downtown Minneapolis (though a few low-power broadcasters use the IDS as their primary transmitter location). This is a list of Television Stations in the Minneapolis-St.Paul area. EWTN St. Michael Broadcasting, Inc.
17.1 WUMN-LP Univision Univision Media Vista Group, LLC. 62.1 WDMI-LD Daystar Daystar 62.3 Daystar Word of God Fellowship, Inc.
1400 KMNV La Raza Regional Mexican Santamaria Broadcasting, Inc.
1470 KMNQ La Invasora Regional Mexican Santamaria Broadcasting, Inc.
1600 KPNP Minority Radio 1600 AM World Music Self Retire, Inc.
90.3 KFAI Fresh Air Radio Talk/Music Fresh Air, Inc.
(KMNV-AM Translator) La Raza Regional Mexican Santamaria Broadcasting, Inc.
(WQOM-AM simulcast) The Big Q Oldies Lakes Broadcasting Company, Inc.
(KFAI Translator) Fresh Air Radio Talk/Music Fresh Air, Inc.
^ "Local Television Market Universe Estimates" (PDF). Nielsen. Retrieved 2 November 2013. ^ "Market Survey Schedule and Population Rankings" (PDF). Nielsen Audio. Retrieved 2 November 2013. ^ "About Us". Rake Magazine. Retrieved 23 Oct 2016. ^ Kitzmann, Shane (6 Jan 2010). "Still Miss The Aquin?". University of Minnesota Newsroom. Retrieved 23 Oct 2016. This page was last edited on 5 April 2019, at 21:41 (UTC).